Arthur Wesley Dow was a painter, print maker, and teacher from the turn of the 19th century. He studied a wide array of different artistic traditions- Middle Eastern tile work, European painters, Greek pottery, European sculpture and architecture, and (most importantly) Japanese brush paintings. In a very Modernist fashion, Dow felt there was a deep compositional synergy between these different artistic traditions (a synergy that bypassed cultural and historical divisions), and that we too could understand and apply the methods by which these various masters divided and used space if we only paid close enough attention to their examples. 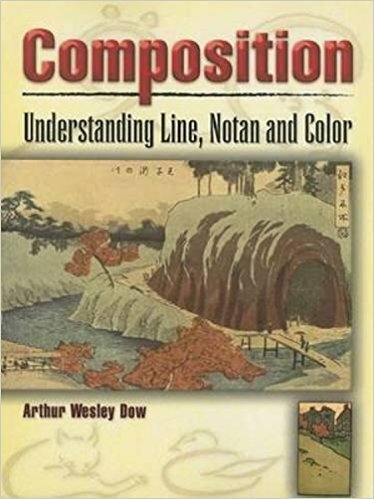 His book, “Composition: Understanding Line, Notan, and Color” outlines his approach, providing many compelling ideas, examples, and explanations. I picked up Dow’s “Composition” two years ago, and although written in a floral, 100-year old prose, it's worth one’s time. I’ve read it over 3 or 4 times myself. And I’ve spent the last year trying to write a review for it. “Why so long?” you ask. Because, despite the fact that Dow seems to have been a compelling thinker, he has, at times, clear deficiencies as a writer. The text is dense as hell, has sections that aren’t useful (IMO) to painters, and has some holes in its applied approach. And yet… And yet. It’s one of the few books I’ve read for leisure with a pencil and highlighter in hand, making notes in the borders to noodle out some extra clarity. That example, in and of itself, is probably a good demonstration of the book’s value and shortcomings. At times, it’s a hassle to read and make sense of, and yet, having done so, I’m glad I did. Here's a hot link to the edition I recommend. Why buy one, when you can read it online for free at the Project Gutenberg site? One, I'm an old fashioned fellow at times, and I like the experience of reading books with physical paper pages- if you're the type to write notes or use a highlighter, this is only reinforced. Two, the book has a lot of prints- both black and white and color- and they're important to the reading experience. Perhaps if you have a large format tablet, like the big iPad Pro, you'd get the same visual experience, but for 20$, I thought the print version was just fine. Ok. So, according to Dow there's a method to playing dark against light, to balancing and dividing space, and whether it's the cast shadow of a sculptural motif falling across a building, the abstract patterns painted on pottery, or the arrangement of trees in a landscape painting they are all built using similar tools of composition. This applies to value-shapes and color-shapes, and lines-shapes too- all three of them are seen as tools to divide the picture plane abstractly, even while they simultaneously represent objects. That’s what’s so compelling about Dow’s approach. Everything is seen as a space-divider, and it’s the kinetic balance and to-and-fro decisions we make that create and drive the energy of a piece. Dow's probably most well-known for introducing Western audiences to the idea of Notan. Notan is a bit of a nebulous concept. It’s about value, but it’s not a value-sketch (which can also be very useful!). In Japanese it literally means “Dark-Light”, but it’s much more than that. It’s really about the balance and distribution of dark forms against light forms. Yes, ye ol’ yin-and-yang. We can experience it by reducing an image entirely to black and white. Not even grey. Only positive shapes against negative shapes, silhouettes, heaven and earth. When you reduce an image to a Notan this way, you begin to see the underlying composition, and (with a bit of instruction and practice) more easily assess its strengths and weaknesses. Much of the best of the book is dedicated to exploring Notan, and, if for nothing else, I would have you check out the book for this concept alone. From this perspective, Dow developed an approach to art making (and art teaching) that focuses very strongly on understanding elements of design and balance first, instead of putting such a strong initial emphasis on technique, drawing skills, or copying nature. “Mere accuracy alone,” notes Dow, “has no art-value.” A landscape painter’s goal “is not …to represent so much topography, but to express an emotion, and this he must do by art.” And what exactly does he think Art-with-a-capital-A is? “Art study,” he says later, “is the attempt to perceive and to create fine relationships of line, mass, and color.” Therefore, as I see it, if the goal of art making is to express emotion, and art study is the attempt to create fine relationships (composition), the thought follows that creating fine spatial relationships expresses emotion. Or so Dow suggests. Can you express emotion through the arrangement of lines, shapes, and color in a picture plane? I don’t know. Maybe? Still, there’s no denying that contrast and spatial arrangement can create a dynamic kind of energy. How else to describe that “thing” which holds our attention? Georgia O’Keefe, who studied and applied Dow’s approach, has this great quote that expresses the guts of the idea- “I found I could say things with color and shapes that I couldn’t say any other way- things I had no words for.” It’s definitely an “approach to art through Structure” that is “absolutely opposed to the time-honored approach through Imitation”. Of course, there’s also the value of Story, that essential emotional human thing that makes us give a damn about a beautifully painted or composed image. Dow absolutely does not talk about this at all. We can debate that too, but the book focuses only on the tool of composition. So I take it with a grain of salt, and leave behind what’s not of use to me. I would say, however, that the impact of a great story badly told is much diminished. Similarly, a well told story that doesn’t have much to say is always just a trifle. So, the two elements go hand in hand. Besides introducing Notan and arguing the importance of composition over technical accuracy, the additional key strength of Dow’s book is that it provides a framework for independent exploration and research. “Composition” is ordered sequentially, first focusing on learning Line, then moving to Notan (more on that later), finally leading to (a rather puny section on) Color. It’s useful and flexibly applicable to many “spatial-art” disciplines. It offers a basic vocabulary for discussing spatial layout (Dow’s five “Principles of Composition”… more on that later too), and provides many excellent historical examples that demonstrate the terms in use. It suggests exercises you can try out, which, I’m sure, bear more or less fruit depending on your approach and whether you have a teacher to guide you or not. All of which is excellent as a starting point for self-education or as a curricular tool for teachers. So what’s the problem? What the book doesn’t do is provide easy answers. In fact, it seems to almost deliberately (perversely?) provide no answers at all. Are all compositions created equal? Absolutely not. And yet, how can one tell if a composition is good or not? If one does a series of experimental compositions to explore a concept, such as Dow often suggests, how does one judge them one against the other? They all use the same basic building blocks (which Dow discusses at length), but, of course, the layout of some images are more compelling than others. But I’ll be damned if Dow spends any time teaching us how to tell the difference. What you will see is a lot of thought provoking, if sometimes vague, almost pseudo-religious talk about Harmony. This makes the book both highly interesting and rather frustrating. Composition, says Dow, is “the building up of harmony”, what he sees as a fundamental process of all the fine arts. Painting is “essentially a rhythmic harmony of colored spaces”. Notan “is the harmony resulting from the combination of dark and light spaces.” One gets the idea. The question, of course, is how do we get there? It’s an elusive subject. It’s easy to point at (see how this painting here works? Or how this light-dark pattern is interesting? ), but it’s much more difficult to describe for the purposes of guiding a student. Instead, what he focuses on is giving us the tools and approach to learn through a kind of artistic osmosis. One must learn how to apply things, as Dow puts it, through “appreciation” of the masters and the development of taste. If we can just get exposed to good art (what does that even mean? ), and unspool the images of those masters we most admire, we can begin to walk down that same long path ourselves, as we blaze our own trails and develop our own sense of spatial relationships and composition. So if you’re looking for a useful set of rules to guide you, you’re out of luck. In an era under siege from self-help books, this tome written 100 years ago completely bypasses all of that more marketable verbiage in favor of a less palatable, but perhaps more honest (and definitely more obnoxious) truth— that learning to make art requires you to learn through doing. And a lot of it on your own. Having said all that, my hope is that this review, in tandem with my follow up posts, will provide a sort of “study guide” and path of entrance into the book. I think the best of “Composition” is that important and useful. I myself will be providing multiple supplemental posts opening up and exploring the use of Notan. Additionally, my perspective is that the input of those people who have taught me (people like Zbukvic and Chien Chung-Wei, in particular) can guide us some as we learn to judge what a “compelling composition” is. For what also becomes clear with reading the book is how essential it is to have a good teacher to get you up and on your way. No one wants to have to reinvent the wheel. As a lover of “The Princess Bride”, I offer this Good Parts version of “Composition”! A good way to dip your toe into the book and assess if it’s the right thing for you. Pg 3-14 “Beginnings” and “The Three Elements”. This is the intro. Well worth reading. All the big ideas are here. Pg 21-28 “Principles of Composition.” Ways of creating Harmony. Opposition, Transition, Subordination, Repetition, Symmetry. Developing better judgment through “appreciation”. I have supplemental content I’ll be offering for this portion. Pg 44-48 “Landscape Composition.” This is part of the section on Line. Really interesting to see examples from fabric design, cabinetry, and pottery compared to designs in landscape paintings. Pg 53-74 Notan. The Heart of the book. Overview, Tasks and Exercises. Excellent examples. I’ve got a couple of upcoming posts on this. After these pages comes a supplemental section on 3-value Notans (rather than the basic 2-value Notan). It’s interesting, but not as well constructed as the earlier section. Then there’s a section on color and another on composition, but these two really feel like afterthoughts to me, and aren’t as fully developed as (nor as fully connected to) the earlier sections. In my next post I’m going to talk about the “Principles of Composition” section of the book. This portion is full of interesting ideas regarding what the “building blocks” of Composition are, but is unfortunately totally opaque on how to apply them for maximum impact. Fortunately, we have the lessons of Chien Chung Wei to lead the way in. We’ll put them all together and see what we get. After the New Year, I got back in to making abstracts again. I go through this every few years (see these old posts- one, two three, four), and I always love the process. Abstracts, at their best, to me, are what we get when we break down the nuts and bolts of art-making, and play with the pieces again, making whatever we want, freeing ourselves from the need to represent objects, and instead allowing ourselves to more directly express thoughts and emotions. The goal, experentially speaking, is to pay attention so strongly to the process that painting becomes a form of walking meditation, where I can allow myself to be guided by a heady mixture of intuition and sharp, clerical thought. Most often I have a broad concept from the very beginning- a title or a thought or a color scheme (or shape!) that expresses an emotion or experience. Sometimes, I have to make a set of marks first and let the fact that it “is” then guide me. Either way, it’s surely not something I just dive in to higgledy-piggledy, where I throw paint and just “go for it”. Very very early in the game, I must have something to hold on to, that will center my thinking. I never pre-design it fully. Because of that, starting can be hard. Of course, starting is often hard, even when I know what I’m painting first. ;) But once I’ve begun, patterns become clearer and clearer, contrasts build that I can take advantage of, and an expression of some kind of order often builds itself. Always I must activate my mind and assess what is already there, guiding my eye compositionally, and, comparatively, where I might like to lead the eye next. So there’s a kind of “flow” I try and catch ahold of. It’s always a process. The goal, if there is one beyond paying attention, is for the piece to itself reflect the process of its being built. In many ways, it’s like watching a movie, where all the frames have been stacked on top of themselves. Spatially, the finished piece is a static object, but it’s also a document that expresses action-through-time. I have four pieces to share. Let’s take a quick look at each. Perhaps something from my process will inspire others to try some abstracts themselves. This is the first one I did, starting from the center and moving outwards. I wet the back, like normal, but the front was dry. It’s all wet into wet, done in one go, perhaps over 2 hours. Staring at it, the power that draws me in is the two semi-opposing patterns- one of value contrast, and one of hue contrast. The center, with the white paper, is clearly very strong as a value contrast. And yet the yellow spokes are also very dominant as the palest, most vibrant hue. I have a hard time focusing on both at the same time. My mind has to shift. The orange body does all the heavy lifting, providing the “meat” for the two contrasts to push against. 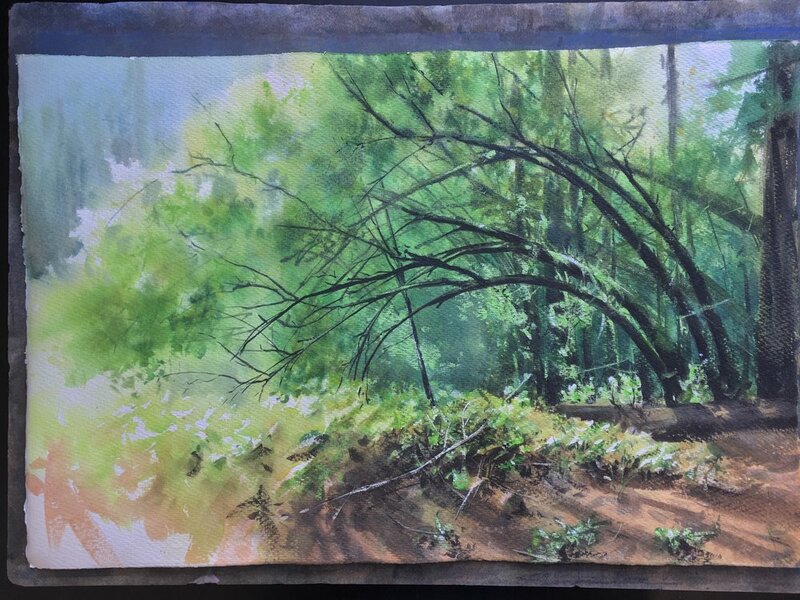 On a technical level, wetting the paper lets me explore things for a long time, dropping in thick wet applications relatively late in the game to help push contrasts. Here I literally started with a table top full of pan lids, bowls, jam jar lids, etc. and a ruler. I started with circles, building patterns where lines led to lines, pulling us in to certain areas, and then began to cut the energy with straight lines, balancing shapes and leaving spaces open. 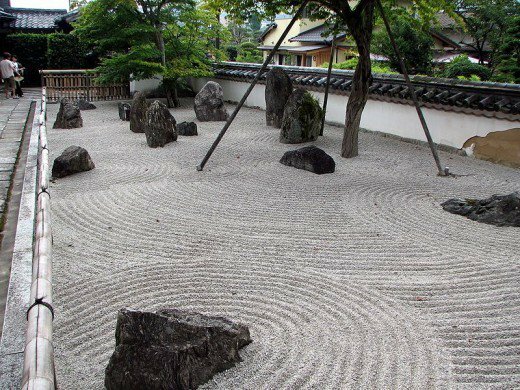 This early phase was really informed by many years of placing boulders as a landscaper. There’s a lot in common, truthfully, between abstract composition and boulder placing- it’s purely forms relating to forms, gravity versus dispersement, density versus spaciousness, guiding lines and points of focus. I’m sure there’s other forms of building and crafts that have similar spatial elements in them too. Once color was introduced, with that too I began to play with warm versus cool hues, letting some bleed into each on purpose, eventually glazing in greys to create a more dynamic exploration of high versus low chroma too. At the end, the darkest darks are applied, as I pull the eyes in. Always, by this time, there’s lots of backing up and staring at it from a distance with my eyes squinting. Very Clint Eastwood. LOL. Rotate it this way, rotate it that way. Look at it again. Really, the process is very similar to a normal painting- compositional sketch first, light to dark, glazing, darkest darks at the end. If you can paint a compelling landscape, you can paint a compelling abstract. If you are struggling with representational painting, abstracts may help you learn to see better. The skill set is the same, just the abstract is naked. Like many paintings, I get in a draft on some of these abstracts and let it sit. I didn’t get an earlier photo of this, before the first set of darks went in, but in the beginning it was very ambient. Greens and yellows and soft edges. I noodled around for a while, looking for contrasts and patterns, and then put it away. Later on in the week, I came back to it and dropped in the first set of darks. These too are built on the precept of contrast. Dark and strong and linear, the goal was to see what happened when I isolated areas and shrank the point of focus. The darks channel our vision and make the colors sing, makes them vibrant. Like a laser, my eye goes to certain spots. Once more, a few days later, I came back and dropped in my darkest darks. Very very dark and thick applications of paint. You can see how they begin to build a sense of depth in the image plane. The strips begin to stack, one upon another. Certain contrasts grow even stronger. And on top of that, again, I dropped in very opaque highlights, activating the darker areas. Yes, I try and pay attention to what I’m interested in expressing, but also what the image offers me. This was a big one, on a full sheet. I worked on it for 4 or 5 days, bit by bit. 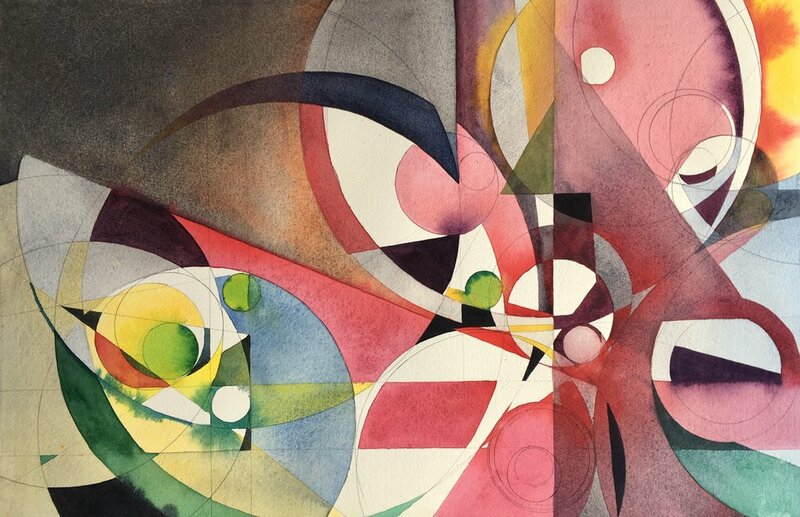 Sometimes these images start with a certain concept in mind, and it changes over the course of the painting experience (“Rotation Into Spring”, “Rotation Into Green”, “Green Pulse”, “Pulse”). That was the case here. Again, I started in the center (but I’ve been thinking of doing one from the outside inwards too! ), and painted with a goal to make green a dominant experience, and to make it “move”. Thus, the yellows and oranges and magentas as contrasting hues, and the movement from light to dark to light to dark. I enjoyed doing the first stained glass style painting, and worked on this as a kind of counterpoint. This painting is very detail oriented, full of patterns and a kind of geometry. Doing these sorts of details is slow and painstaking. I look at it as an opportunity- watching my breathing as I paint, staying focused. Eventually, however, I came back to it and decided it was too tight. Too crisp, too dark. I couldn’t escape from the flower I’d created. It wouldn’t pulse. The edge was too strong. Bah! I wondered and wondered what to do, and decided, as always, to go for it. You have to be willing to fail if you want to succeed, right? What’s the joy in playing it safe? As such, I filled up the bath tub and dropped the painting in! As is often the case, these sorts of experiences are both scary and liberating. There was some bleeding, and some paint in the thicker areas (the leaves pointing outwards and the center-most circle) “flaked off” and created some aging and worrying to the paint surface. Of course, I knew some of this was going to happen- it was practically the point of submerging it in the bathtub- but you never quite know how it’s going to play out. Here, the lightening of the paint helped bring back the color. That’s what makes it exciting though! The painting was back on! A finished painting is an artifact of a moment, sometimes a beautiful artifact, but a painting in the process of being made is alive!! I built the swirling sense of motion and heat wet into wet, around the exterior, and dropped in the hard, plant-like objects around the exterior, to help your eye escape from the wheel. If I stare at the center for a bit, there is, for me, a definite gentle sense of motion- a pulsing and rotating. 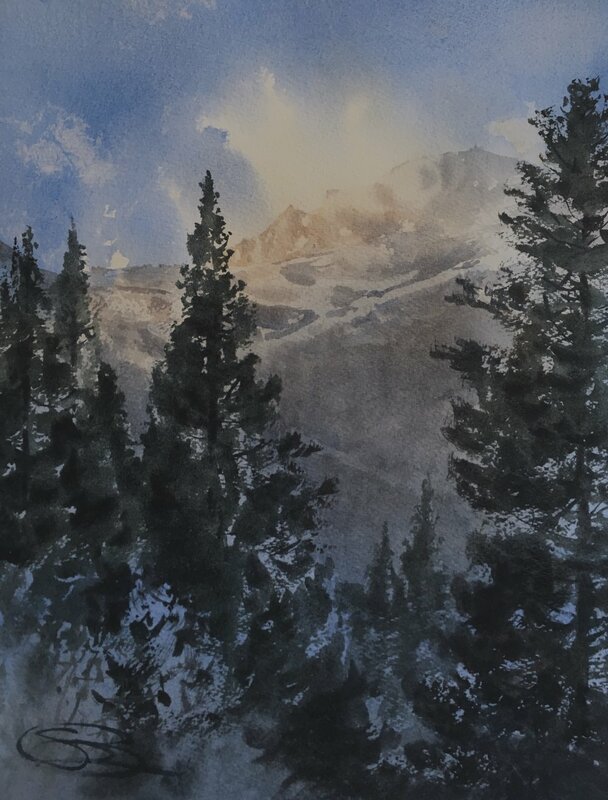 This is when I knew it was time to put the brush down… I was looking for things to add, but was already as far as I needed to go. Doing an abstract is very liberating. It’s exhausting, but liberating. Doing a series can be highly educational. I often allow myself to try things I wouldn’t in a representational painting. Sometimes this helps me learn things I can apply elsewhere. While it’s most definitely a meditative practice, totally outside the concept of success or failure, in it’s own way it’s also a skill-stretcher. Can I make a compelling image without the typical story-telling elements I use? I have to ponder color contrasts and value contrasts and edge contrasts. A title can mean a lot, to lead you in. 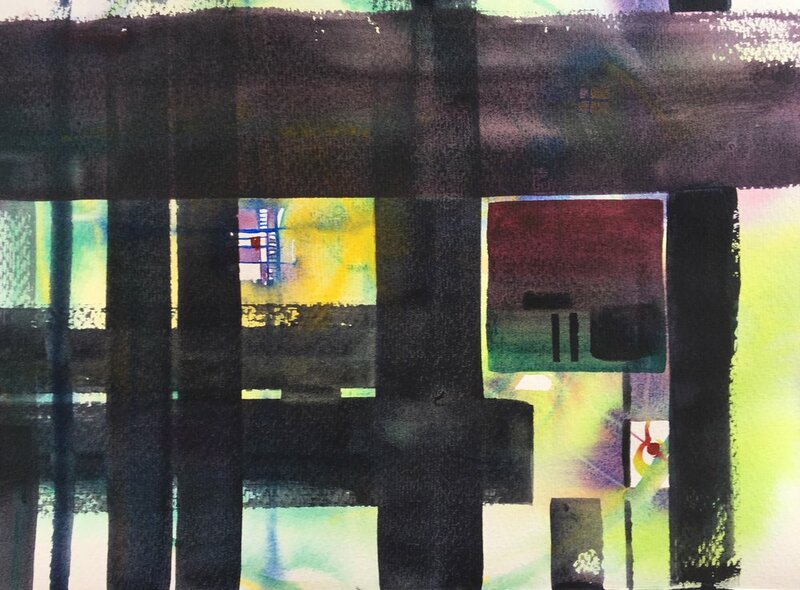 A bit like ballet or listening to music without words, abstracts try and express something without the typical story-cues we love and anticipate- barns and trees, cars and skylines, shadows and memories. If the abstract is successful, it’s because of all the same factors as a more typical representational painting. If it fails, it’s for the same reasons. As an artist, that’s compelling. I went to Navaro State Park back in September, and panted in this location. Heaven! The park is up the rural northern coast of California, past Booneville. It follows a river, and the air is rich and humid and warm under the trees. The duff on the forest floor is so deep that walking on it actually becomes spongy and soft. The fragrant, heady smell of bay trees and redwoods is everywhere. Deep in the quiet woods… the creaking of the redwood boughs high above. An easy place to get suckered in to painting terribly difficult subjects! Hahaha! Here’s the little sketch I did on site. I had to jet, and it was towards the end of the end of the day. I might have spent 20-30 minutes max. I just wanted to capture the mood— that sense of deep recession under the redwoods and bays, like a vaulted ceiling. Little did I know, however, how hard it would be to get a completed painting out of this. What was so hard was that the foliage up above is really just an ambient texture. It’s hard to add it in and make it read as leaves attached to a branching system. A few weeks later, I decided to try it again as a half sheet, adding more visual texture to the canopy while also focusing on that stretching, arching feeling by changing to a wider format. 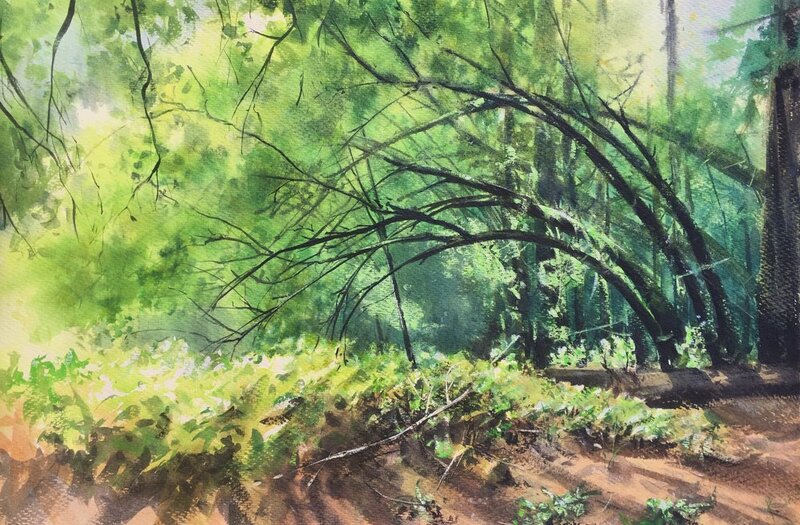 In an effort to increase the sense of depth, I also tried to preserve some highlights on the ground plane plants, to help separate the values between the foreground and midground some. I finished it, and although I liked it better, I still really wasn’t satisfied. There wasn’t a sense of cast light on the floor of the forest, nor a sense of vibrant light pushing through the canopy. Where were all those deep shadows I remembered? In answer to these issues, I did it a fourth time a few weeks later. I brought in the edge of the canopy on the left, to help create an “umbrella.” You can see that I’ve retained some new highlights on the upper canopy, as well as a greater set of vibrant highlights down below, on the little ferns and leaves. I came back to it. I just couldn’t let it go, and my attitude about paintings I’m dissatisfied with is to go for it. Who cares if I screw it up? I didn’t really find it successful anyways. From here, over the next few weeks, bit by bit, I sort of snuck up on the painting, doing a half hour here and there, thinking I was done, propping it up so I could look at it from a distance now and then while doing stuff in the kitchen, only to still not be sure, and jump back in again. First, I dropped deeper blue shadows into the shade, cast shadows from the trunks on the right, deeper shadows in the foreground, etc. I also added more opaque highlights in that area, trying to get a sense of depth and layering. Again, better, but still I wasn’t satisfied. I set it back into the discard pile and worked on other things. Here, I decided that the image was too “far away” and cool. I wanted to be down under the canopy myself, and that warm lime-green light, not looking at it from afar. I dropped in a wash of yellow-green over the sunny foliage, to warm things up. Then I brought the branches down from the top left to close the composition off and bring the foreground into the top as well. I added highlights and bits of scruffiness to the lower foreground too. Once again, I did a scruffy glaze in the deep shadows along the horizon line, getting it a bit darker again. In the next step, I brought the foreground foliage down around the front left, pushing all those cast shadows and backlighting in. Thank you to my wife for the thought! :) Now, I could finally see, after a few months working on this on and off, that I was getting somewhere. Failing a lot is hard. It’s disheartening, but if you’re doing your job right you’re atleast exploring and trying new things. Often, succeeding is when the painting process is most difficult creatively— because you begin to want to play it safe. You don’t want to ruin it! But this is just when I think you should go for it! I figure go big or go home. What are we here to do, if not to share and express our inner selves as truly as we can? How can be do that tentatively? Bah! I decided to push my darks even farther down within the canopy. Screw it. 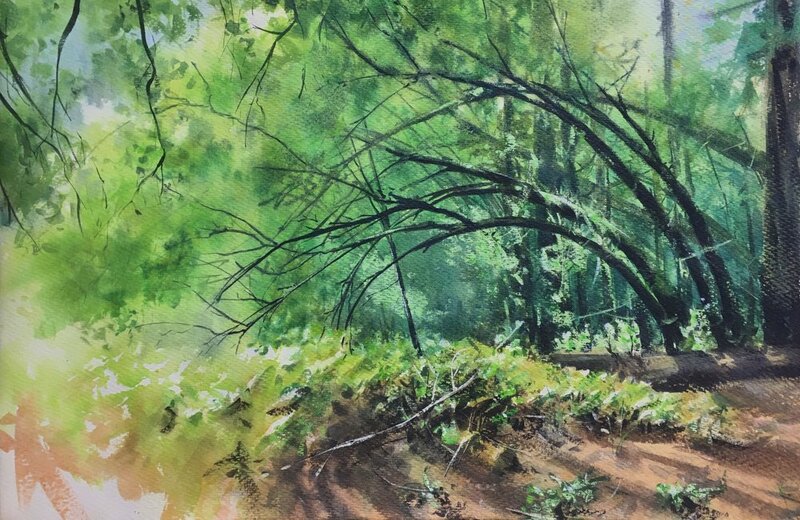 I wanted those woods to be deep and murky and full of texture, and for the foreground to be bright and sunlit by comparison. Did I push it too far? I don’t know. But the final affect is strong, and there’s no going backwards. This is where I set down my brush on this one, and taped it up on the “recently finished” wall. If I decide I’m not happy with the final results, there’s nothing to do but paint it again! Today I am going to touch briefly on the interesting experience of photographing your painting and figuring out that you actually prefer the photo. !! This can be disconcerting, but it’s also very instructive. There are clearly times I prefer my painting over the photo, and photo work (of the iPhone variety) is definitely limited in terms of the of color-diversity it can accurately capture. If you are pushing contrasting hues, photos will almost always push a Mother Color and nudge everything one way or the other. But photos are also very good at pushing contrast, and there are times when this is what a painting really needs. Here’s my reference photo. It’s not much. I took this last winter in Yosemite, as the last light was setting behind me, and the mountain across the valley was lit up, misty and glowing. Crappy photos like this (LOL!) can sometimes be good reference photos. They provide the basics of shape relationships but they’re deficiencies also leave a lot up to memory and artistic interpretation. I very much remember the mountain being warmer, and the foreground trees being cool and shady. Sometimes, after I take a photo, if it’s not quite correct (like this one) I even type out some sort of color notes as well, for future reference. So, here I relied on memory and got to painting. This is what I got on the first-go around. I really liked some of what the photo did to the image. The contrast is definitely stronger. This was achieved by opening up and brightening the paler area. Notice also that everything has a gently warmer cast. To me, in this image, it works- mostly because the image is so cool already. By pushing the warmer elements a bit more, it actually creates a richer complimentary hue-contrast. A week later, I set to work, repainting the image. Of course, being an artist, this was painted on the last possible day to submit to the Yosemite Renaissance show. So, it was either hit a good one or go home. LOL! I used my memories, the original painting, and the skewed photo as references, and went for it. I focused on two basic things- keeping the central area paler and warmer, to provide a honeyed backdrop for the darker green trees to pop against, and pushing the blues down in the foreground to really accentuate the hue-contrast and make the mountain glow. Is it better? I don’t know. It’s definitely different though, and was what I was aiming for. So, by my judgement, yes. As always, part of the charm of working in watercolors (to me, atleast) is that every image is it’s own. You can’t futz with it too much, to get it “just right” the way you can with acrylics or oils. Instead, you have to keep moving forward, iterate an image if you want to do it differently, and accept each painting as it’s own artifact from a moment in time.